Death metal band Miasmal originating from Gothenburg, Sweden has released their third album which is called "Tides of Omniscience" totaling almost forty-one minutes, with ten tracks of the most endemic Swedish death metal, Death 'n' roll spiced with some Punk features, their sound cannot be different but is clearly robust and bold and just in time to take part in the rebirth of the new blood of Swedish death metal with bands as Feral, Repuked or Revolting, who are waving high enough the death metal flag for the new generation. 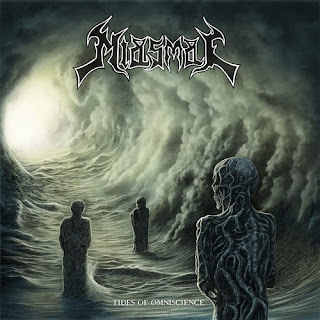 "Tides of Omniscience" is a solid album rooted in the classic style of the old school death metal, reminiscing bands like Grave, Dismember, Entombed and At the Gates in this album Miasmal achieve with facts to transmit the essence captured in the nineties, is not easy to discern among the overpopulated scene of bands trying to emulate those days, but fortunately for us only few ones are able to do it, of course we would be guilty saying that they have an original sound, or they are redefining the genre, that would be totally false, however they know how to impart their unique stamp, incorporating and blending the right amount of riffs and blast beats at the right time. Axion kicks into action with some stunning drumming followed by heavy guitar riffs which delves nicely in a rhythmic section before the raspy vocals by Pontus hit the speakers, if you were expecting guttural vocals almost inaudible, well I guess you will be disappointed, then is followed by the equally devastating track "Deception" dragging you into an unstoppable hell with its particular blend of speed, groove and deadly dose of heavy riffage, "Venomous Harvest" simply, keeps the pace of the album extremely fast without mercy always incorporating the right tunes in their rhythm section, "Perseverance" brings the balance and calm with a slower pace but heavy riffs, aside from the previous tracks this one is perfect for a middle piece album with an excellent guitar solo heading to the end, "Earthbound" does not fail to deliver an impressive death 'n' roll with catchy riffs and bass galloping lines ensures a hellish headbang, "Fear the New Flesh" owns that bizarre and raw punk hint riffing able to sketch a devilish smile from you approving what you listening, the last track in this album is "The Shifting of Stars" delivers an acoustic intro, very suitable allowing us to take a breath for few seconds, before turns into a massive and frantic blast beat fest with crushing riffs. 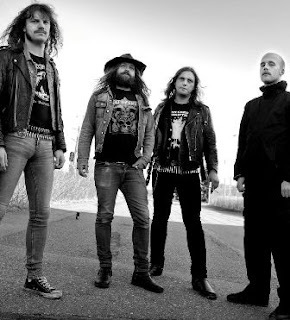 At the end Miasmal seems to fulfill above average for a general audience, but if you are still holding on to those days of the early Scandinavian death metal, here is a band that definitely are able to accurately recreate the sound, which we are all bound.